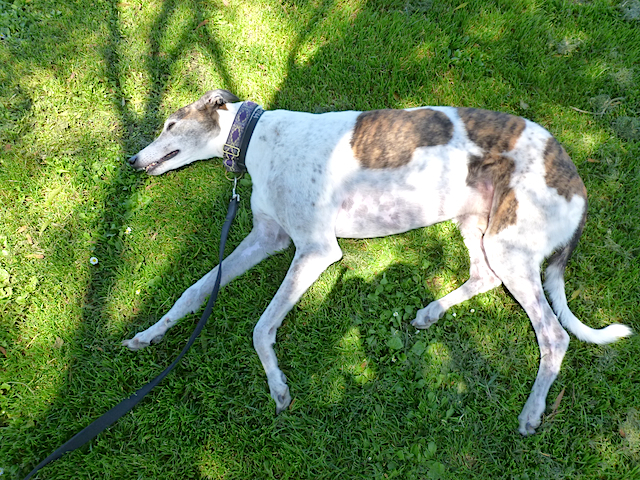 Walking with Shimmer | I'm a walker, he's a greyhound, we meet a lot of nice people. Today, Shimmer and I were one of THOSE people. Here’s the story: I needed to pick up cat kibble for our cats. A task Shimmer couldn’t care less about, except that kibble was involved. He’s a fiend for kibble: dog, cat, monkey—he’ll chow down on it all. So, he wasn’t exactly disinterested when I told him we were going to the store to get some cat kibble. He had been inside the store with Joan before, so it wasn’t a new experience for him, but I was still uncomfortable with the idea. There was a sign that said No Dogs Allowed Except Service Dogs by the door, and it didn’t feel right to go in. Shimmer, however, just like any other customer, walked right through the automatic doors. “Do you mind if I come in with the dog?” I asked the sad-eyed cashier. “Everyone else does,” she said wearily. Shimmer headed directly towards the Pet section, which he dismissed immediately. No interesting squeak toys, chew bones, or plushies. One dismissive glance and he turned around and headed back to the exit, giving me only a moment to grab a bag of cat kibble. I told him we had to pay for it, which I did, while he studied the candy section, and probably thought of all the ways life was unfair. First, he had to go to the store for cat kibble, and then, there were no dog toys for him! Imbécilles! 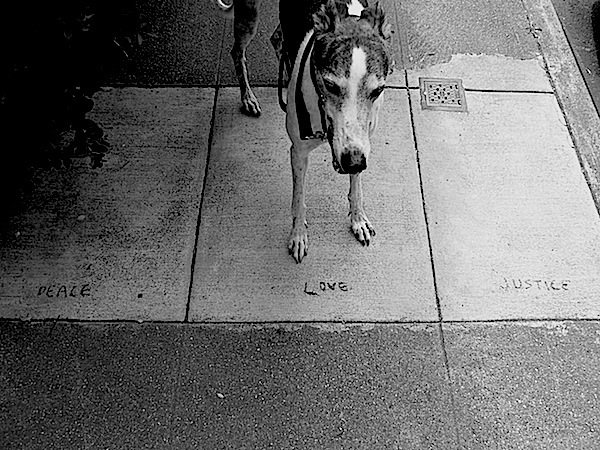 I told him of course I’d help him write a complaint letter to the store about their terrible selection of dog items, but only when he learned to sign his name. After all, I still have to shop there. Shimmer belches, end of scene. Shimmer and I were walking home when we heard what I thought was a bird in distress. A high-pitched “Pip, pip!” was coming from up a nearby hill, so we went to find out what was happening. The coyotes have new babies, and by the sudden increase in Missing Cat posters in the neighborhood, I know they’re hungry. Shimmer and I were ready to stop any trouble. We didn’t have an actual plan, mind you, and probably would have stood there and yelled along with the bird, but off we went. Instead of finding a scene out of Mutual of Omaha’s Wild Kingdom, I saw our neighbor, Katherine, and her dog, Billy. And, it turned out she wasn’t yelling, “Pip,” but “Poop.” She’s from England, so there was a bit of an accent issue, which I joked about, but she didn’t seem to find it quite as funny as me. “Maybe you should have used a different word,” I suggested, noting Billy was studying a nearby gopher hole with sphinx-like intensity. Clearly his attention was elsewhere. Shimmer and I, recognizing we weren’t helping, or even welcome, said our good-byes and left. At the bottom of the hill, we could still hear her exhorting Billy to do his stuff. “Poop! Poop!” As her desperation increased, her voice seemed to grow higher with each word. She should have said, “Fly, Billy, fly,” for all the good it’s going to do her, I whispered to Shimmer. He peed on a bush in agreement and we continued home.